My memory must be playing tricks on me. Always thought the game was in May, not December. The penalty shoot out was a long one. Given the previous food announcements of late there will be no vegetarian or vegan option. We had this debate about the price of the Back to the Valley dinner but that sold out. Not a price I'd set or pay but there is a proven market for these dinners at these prices. The problem is, IMHO, is that there aren't enough dinners or Q & As at lower prices/free other than Bromley Addicks and occasionally City Addicks. East Kent Addicks Anonymous also hold events but no else knows about them. It's a Platinum fixture, like Charlton v Gillingham. Yep.......I had my celebration back in May too. didnt cost me £95 either. maybe not the beat time around Xmas with loads of nights out and other expense though. Embarrassing and 7 months late! Don't get this. Why slag off the Trust by calling what they are doing "embarrassing"? 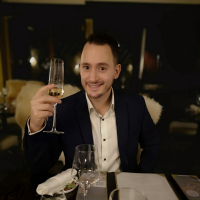 What can the Trust do about there being "nothing else to celebrate"? Yes, it would have been better in May but for whatever reason it wasn't organised then, it has been now. Better late than never. I didn't realise it was a Trust thing. I assumed it was something to line Roland's pockets. It does say "in aid of the Charlton Athletic Community Trust" on the flyer on the first post and the contact details for booking are for the Trust. 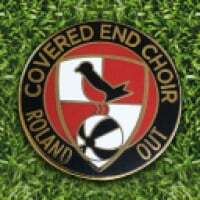 You can rest assured that the Fanackpans wouldn't be attending if any profit went into the Rat's coffers. 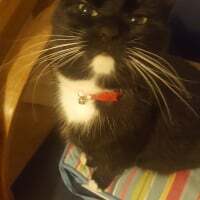 Our dear friend who's involved with CACT has generously purchased a table as she did last year and we are very fortunate to be 2 of her guests. Primark, here I come ! Had a good meeting with Jason Morgan and Annabel Upson from the Trust last night. We're working on how to best display the play-off items we have. Jason pointed out that holding it last May would have been ideal but there was already the player of the year do then plus the uncertainty over dates due to league one play-offs. It also takes time to confirm everything and that wasnt possible by May. Also the December BTTV dinner had been a sell out and a good fundraiser. The price is set to cover costs with most income from the trust coming from the raffles, auctions etc. It's not just the food but the staff, hosts, plasma screens etc etc and covering the guests and their partners. Delaware North aren't charging for the room btw so it's no money spinner for the club. The trust are still waiting for responses from more players. They had 20 years to plan it! I'm sure it'll be a fun evening for those attending, what's up for Auction, anything decent? The Trust have hit a formula where they know companies they have a good relationship with and a few well off supporters will always take a batch of tables to make these things viable. It will effectively be a repeat of the dinner 12 months ago but with the people there wearing different ties / dresses. Good luck to them and those going, whether paying or on freebies, but these events are no longer aimed at appealing to the bulk of the fanbase. I'll bid on the garden gnome and get Big Mervs autograph for you if you want? I kind of agree AFKA. I'd love to go but the days of frivolous spending and chasing your hero's round a room trying to pinch their bums (only joking of course never would i do such a thing) are on hold for the moment. It will of course sell out and lucky are those able to afford to attend. Should they publish the menu in detail? As I said above the problem isn't the £95 (what a lot of people on here pay to see a concert, etc) but that there are very few free or low cost events now that the club doesn't do Q & As and there are few active supporters' groups left organising such do's. The POTY is £40 and some felt that was too much. 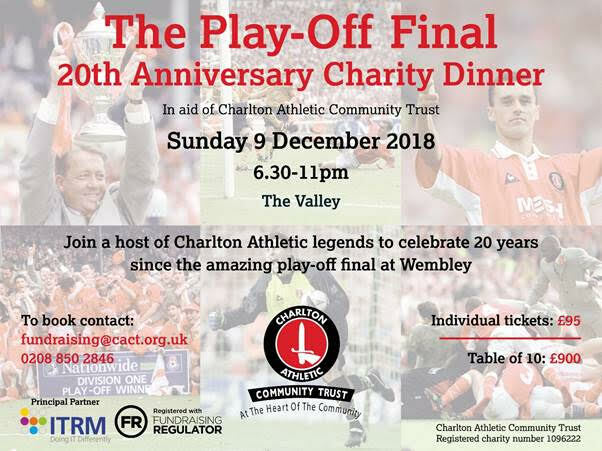 Lee Bowyer, Johnnie Jackson and Chris Solly will be attending Charlton Athletic Community Trust’s (CACT’s) 1998 Play-Off Final 20th Anniversary Charity Dinner on Sunday, December 9th.Jon Fortune will also be present alongside his former teammates. What part did the people named above play in the play-off final? I imagine Solly would have been about 6 years old back then, so not a lot. Bowyers transfer fee was used to build the promotion team!